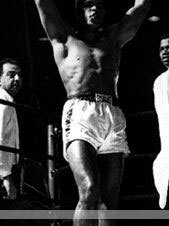 Muhammad Ali was three-time world heavyweight boxing champion. 17 January 1942, Cassius Clay (Muhammad Ali) born in Louisville, Kentucky. 1960, won light-heavyweight gold medal at the Rome Olympics. 25 February 1964, fought, and knocked out Sonny Liston; became heavyweight champion. 1964, joined Nation of Islam. 1967, inducted into the military but refused to serve. 8 March 1971, Ali lost to Joe Frazier. Supreme Court ruled in favor of Ali. 28 January 1974, Ali won unanimous decision over Frazier. 15 February 1978, Ali lost the heavyweight title in a split decision to Leon Spinks. Ali regained the title from Spinks seven months later. 1980, Ali lost a comeback bout to Larry Holmes. 1981, Ali lost a comeback bout to Trevor Berbick. 1996, Ali lit the Olympic flame in Atlanta.